Last week we looked at half the teams in the league in no real order at all, and their season to date. This week, we discuss the other half of the league. After round 5 we wrote about North Melbourne’s intriguing tactical schemes and the way they were enjoying success based on exploiting the talents of their group of older players. We speculated about whether they’d sustain their form, and that question has been answered in the affirmative in that they’ve sustained their level. They’ve actually improved offensively to the same degree that their defence has declined to merely being strong. The Kangaroos are being excellently led by their veterans and their other older players, and with good selection stability they’ve been able to use their cadre of established players effectively, with only Waite spending much time injured. Their top end as measured by Player Approximate Value are mostly in the 25-30 range, with an older Thompson and Waite still on the list and a smaller group of young support players filling the team out. None of the Kangaroos aged 24 and under necessarily look like star players, but they’re continuing to play useful supporting roles in defence (Dumont, McDonald, Williams) and forward (Wood). Now that the 25-30 has proven they can lead a competent team, they’ve bought some time to recruit the extra pieces they need. North need more draftees, and in particular they still desperately need to find younger midfielders. Only Simpkin and Anderson are really contributing much in the way of midfield value right now, with Hartung and Turner playing more fringe roles and the heavy lifting falling predominantly to Higgins and Cunnington along with Goldstein as ruck. If they are going to finally use their alleged warchest, and can only take one of the players they’ve been linked to, we’d suggest it’s the pure midfielder in Andrew Gaff who best suits their needs. De Goey could potentially release Ziebell back into the midfield, but given this forward setup is one of North’s strengths, would that move be more successful than just getting Gaff? But, there’s an additional ploy to North being seemingly attached to every big name player – squeezing the salary cap of other teams in future years. If every club has to pay a “North tax” on the players that they keep for the next three to five years, North can both bank the cap saving and capitalise on a what may be a bull market as a result. Agents would be happy to go along with this, as their clients would be paid more in both the short and long term (increasing their commission). Just as GWS’ season hangs by a thread and they face four pretty tough games in Hawthorn, West Coast, Richmond and Port Adelaide, they’ve lost Jeremy Cameron to suspension for that whole period. We listed him in our PAV-derived All-Australian team because he’s rated as one of the best offensive players in the competition this year. But beyond his raw value, he’s also been the focal figure in the shaky Giants this year up forward, centralising the Giants forward play even more than many other teams with a dominant focal point up forward. Sorting by offensive marginal Player Approximate Value (mPAV) we can see how quickly GWS’ offensive output drops away after Cameron (and the long-absent Greene). This is not just a matter of Cameron being a dominant target. 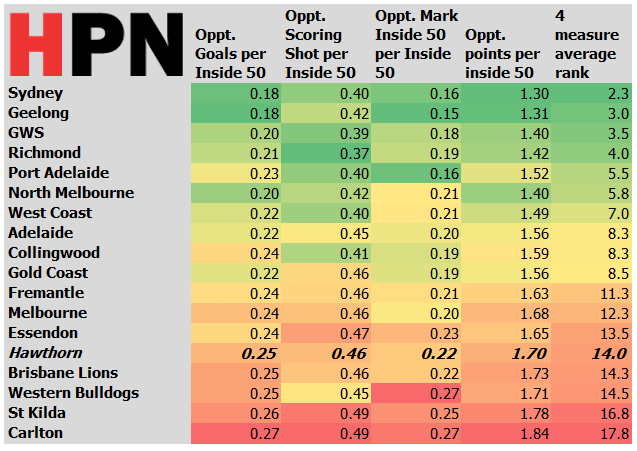 If we look at the other teams with the strongest offensive players, such as North Melbourne and Sydney, they have had six and five players respectively this year who have been at least as valuable offensively as Josh Kelly, GWS’ third most effective offensive player (Kelly is roughly on par with Parker and Higgins in that area). GWS haven’t had other consistent contributors in the way Sydney have had small forwards and North secondary marking targets. The Giants desperately for Patton and Himmelberg to step up if they’re to weather the storm until Cameron and Greene return later in the year. Patton’s lower than expected mPAV this year can partially be put down to his stint in the ruck, and subsequent loss of confidence afterwards – something he should be able to rebound from. Earlier we wrote about the extreme defensiveness of their midfielders earlier in the year, and although they’ve become a little less anchored into defence since then, they likely will have to get more attacking still. GWS may look to Tomlinson’s deceptive height to bolster them, but the talls NEAFL cupboard is fairly bare. Dawson Simpson is already rucking in the seniors, and that leaves only below-replacement Lachlan Keefe along with untested rookies Mathew Flynn and Zac Sproule as available for call-up. The Saints have had a pretty bad year! In 2017 they were mostly fairly average across the board, with their midfield perhaps the strongest by a small margin. This year they’ve fallen away everywhere, sitting near the bottom in offence and defence and about 6th worst in the midfield component of the HPN Team Ratings. There’s been a blanket decline at both ends of the ground for the Saints, but something that stands out is the way they’ve lost the control of the midfield they were able to maintain last year. They’ve sunk from being reasonably strong in the ruck to having the worst hitout win ratio in the league, and clearances have accordingly also declined. This is probably because Billy Longer is better than Tom Hickey and hasn’t played much in 2018. Longer is back now, having played in the win over the Gold Coast. Perhaps he can help the Saints stem the bleeding as they work out how to at least get back to last year’s lower-mid-table levels. The very tall forward and reluctant part-time ruckman finally got a call-up after well over a month toiling in the NEAFL, and the former top-ten draft pick immediately set to work helping the Suns’ generally terrible forwardline. Wright finished with two goals, two behinds, but most importantly, grabbed four marks inside 50. Lynch as solo target being quadruple-teamed was obviously not working even slightly over previous weeks, and Wright instantly helped stretch opposition defence. The Suns took 15 total marks inside 50 from 42 inside 50s, a rate of 0.357 marks inside 50 per inside 50. Prior to this game, the Suns had managed just 0.139 marks inside 50 per inside 50, easily the worst in the league, twice as far from average as the Blues. It’s one game, but it could have been a positive sign for the Suns ailing forwardline for the remainder of the year. Unfortunately they’ve now been thrown another curveball with Lynch going for knee surgery and missing the remainder of the year. However, another factor to the Suns elevated forward marking potency in this game is probably just that…. The Hawks have an intriguing set of players this year as they search for a new identity, but the critical weakness that stands out for them is that they’re a bottom six side inside defensive 50, 5th worst in terms of points conceded per inside 50. What’s going on there? Their main defensive players this year have been Sicily, Stratton, Frawley, Hardwick, Duryea, and Burton. This group is conceding a mark inside 50 on roughly 22% of inside 50s compared to the league benchmark 15% for Geelong. They’re being protected by a dominant midfield, but when put under the pump they’ve been exposed by both smalls (Ronke’s 7 in a Franklinless Sydney) and talls (Hipwood’s 4.3 the very next week). It’s not a new issue, either. They were about 14th or 15th for opposition scoring per inside 50 last year too in spite of the presence of Gibson and Hodge. The main difference this year is they’re conceding more marks per inside 50s as well, even though their nominal first-choice key position defender in Frawley has returned back after missing most of 2017. Frawley has reclaimed his key position defensive role, and that’s meant Gunston returning to the forward line and Brand disappearing to Box Hill. It’s hard to identify why they’ve been so porous but the issue may simply be lack of depth down back. James Frawley and James Sicily are near the top of the league for having low loss rates in “Contested Defensive 1 on 1s”, as available on AFL StatsPro. However, the rest of the group do not stand out as great defenders. Team defence matters, and the lack of continuity over the last two years might be taking its toll. Sides don’t need to consistently be on the right side of clearance counts in order to have success, and it’s becoming increasingly clear that a good clearance ratio is more stylistic than a reliable measure of success. 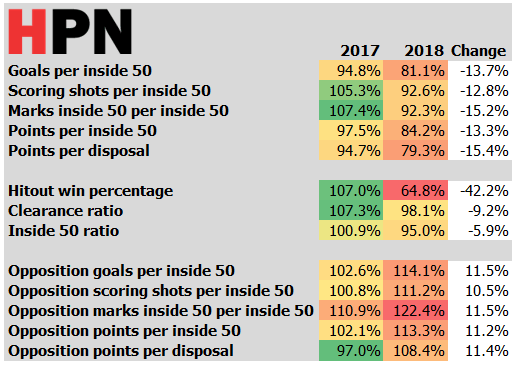 However, the good sides with high clearance ratios (Collingwood, Port and West Coast) are converting their first use of the ball into a preponderance of inside 50 opportunities. Fremantle, currently with the best clearance ratio in the league… are not doing that. Winning first use of the ball via a dominant clearance ratio isn’t the only path to midfield success. 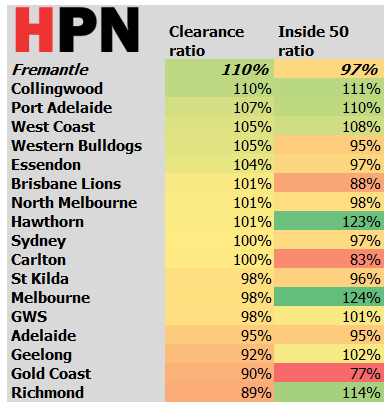 Witness Richmond’s league worst clearance ratio and Hawthorn and Melbourne’s breakeven clearance rates, which are coupled with quite a good advantage in inside-50s. Since clearances are probably somewhat a stylistic focus, a team can bump up their rates by putting more players around the ball, for instance. Teams can also sacrifice clearances to have more players spread more widely and force turnovers and exploit rebound, as it appears that Richmond do. The question is whether Fremantle are over-investing effort into winning a majority share of clearances and sacrificing quality elsewhere. We actually suspect not. According to PAV the main midfield group for Freo includes most of their key older players such as Fyfe, Neale, Walters, Sandilands, and Mundy, with the younger supporting crew of Langdon, Cerra, Banfield, Brayshaw and Tucker still very much playing second fiddle. It’s likely that the side is just naturally doing better where the key older heads are located, with their work undone by inexperience and disorganisation elsewhere. They’ve started using Mundy forward, and this may point to the next step in Freo’s development – mixing and mingling the experienced guys throughout the side and getting the midfield support cast to begin shouldering more load around stoppages. They have other issues, wth lack of forward targets being chief among them, but this is a development side which must work with what it has. We wrote about Port Adelaide a few weeks ago, about the Showdown with Adelaide being a pivotal point in both their seasons, which at this stage has come to fruition. Port’s much vaunted offseason recruits have had varying levels of success, with Thomas’ goal last week being key against the Demons, while Watts languishes in prisonbars. However, one Port player that is often ignored is the second most bearded man for the Power, Justin Westhoff. Nick Rynne at The West Australian used PAV to determine that he is the most well rounded elite player in the league this year, a sentiment we fully agree with. If you have a spare couple of hours on the weekend, look at how he moves around the ground. HPN has a longer piece on Melbourne cued up for tomorrow, so consider this to be more of a teaser. Melbourne dominate the battle for territory, leading the league for inside 50 ratio. They can score at will when they want to, and are the highest scoring side in the league to date. These are signs of a good football club – strike that, a great football club. Top four, maybe even a grand finalist. But their defence has been terrible. That image at the top of the page is a sorry sight for the Demons. For a side who has spent much of the year with three All Australian squad defenders from last year (Jetta, Lever and Hibberd), they’ve struggled mightily with anything resembling a top line attack. If they can fix how their backline plays, they might be able to go all the way. But that’s a giant “if”. There has been conjecture that Dustin Martin is having a *little bit* of a quieter year, especially after his stellar 2017 season. According to PAV, this is somewhat true, with Martin being rated as the 10th best player of the season to date with 21.74 PAV. That still places him in the top 2% of all players in the league – pretty damn good! But how common is a slight dip after a stellar year? 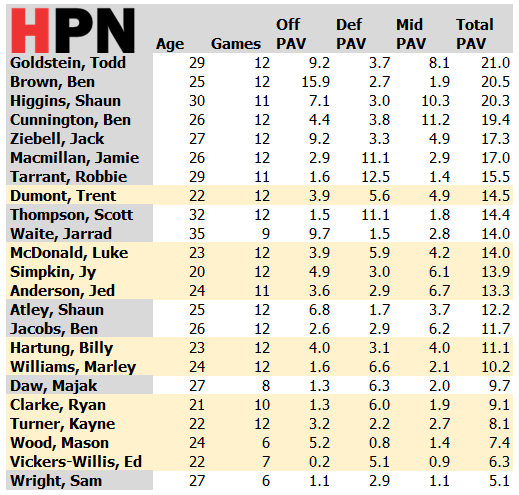 HPN looked at the top five PAV getters in each season between 2007 and 2016, and how they did the following year. Of the 50 players in the sample, just eighteen were able to remain in the top five in the next season as well. 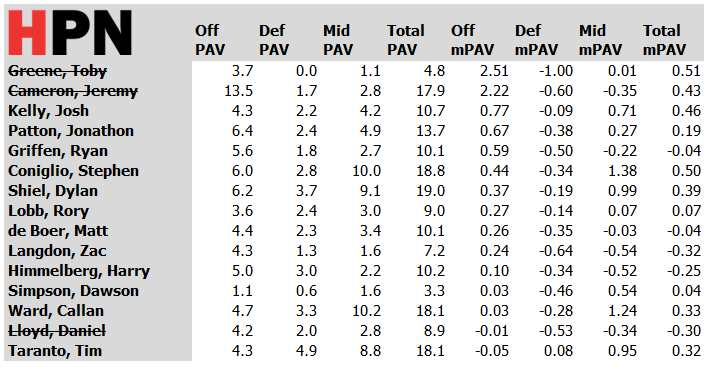 About half the sample have done like Martin has so far this year, and remained in the top 10 for overall PAV the following season, still placing these players in the top echelons of the competition. However, only two players have dropped outside the top 100 for the next season (Dane Swan in 2014 and Chad Cornes in 2008). Why is this the case? Well, injuries account for the fall of some players, and age remains undefeated, but sometimes the league adjusts to a the most damaging of players, and forces their teams to beat them in other ways. Richmond is far stronger in 2018 than they were for much of 2017, and Martin has spent a lot more time up forward. He rarely goes past the half way line to collect the ball, and can win one-out contests regularly. The Tigers arguably have a deeper midfield contingent than their forward line, and it may be a case of deploying their best weapon in the area of greatest need. Whatever the case, Martin’s slight dip is just that – slight. Next Post:Can the Demons think outside the box and take that last step?